The left and center field bleachers at Wrigley Field opened to the public on Monday. CHICAGO (WLS) -- There's plenty of blue in the Wrigley Field outfield once again. The left and center field bleachers opened to the public on Monday. Opposing outfielders had it easy here in recent weeks - no heckling, no beer showers. But on Monday night, the bleacher bums were back. It didn't take long - the bottom of the first - for the Cubs to christen the new bleachers with a long ball. This day was long-awaited by the Cubs' faithful. "It's like opening day all over again. There's a lot of excitement. All the people coming back. Left field is open again," said Matt Dillon. At a little past 5 p.m. Monday, there was a bleacher "bum rush" since those seats are still general admission. The green aluminum benches are still familiar but there is more seating, renovated concessions areas, additional standing room-only sections and event spaces for groups of 25 to 150 people. "Before, we weren't really able to accommodate large groups of people, especially those that wanted to make a special event out of it," says Cubs spokesperson Julian Green, "whether it's a bachelor or bachelorette party, or a small or large corporate outing." The right field bleachers are still a work in progress but remain on track to open June 11. Once they are complete, there will be about 500 additional outfield seats and standing room spaces for fans. The Cubs will host a big event in the bleachers for fans next month. The Cubs play the New York Mets at 7:05 p.m. Monday. 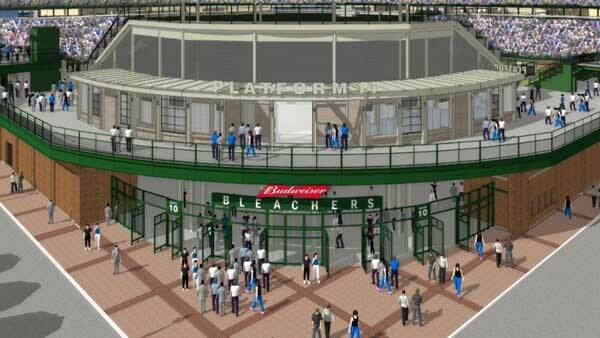 The Chicago Cubs released renderings of what the new bleachers will look like at Wrigley Field.